Welcome to Kerargon-by-the-sea, holiday rental homes with character whose historic charm and unique location offers a special ambiance for that memorable family or friends get-together! Tucked away down a private lane but just minutes from the beaches of Brittany, Kerargon's two granite farmhouses can comfortably accommodate large groups of 12, 14 or together 26 persons (of which 2 must be children under 9). In these charming Breton homes, special care has been given to outfitting the kitchens for cookery enthusiasts and to making each house distinctive with individually styled bedrooms, comfortable lounges, and newly renovated bathrooms. Most importantly: Kerargon offers you that "at home" factor: you arrive at a welcoming home with lots of unexpected extras (including tide-you-over supplies of tea, coffee, sugar, vinegar, oil, toilet paper, and cleaning supplies). In addition to a large south-facing courtyard, each house has its own private garden with a terrace, lounge furniture and BBQ. There are on-site Brittany enthusiasts to consult, if you so choose, for tips on places to see, where to eat, and whatever your special interests are. Thanks to its secluded position in the countryside, Kerargon-by-the-sea is especially quiet and safe for children while in close proximity to Brittany's many wonders. Two towns (Landudec and Pouldreuzic) lie in easy reach (4km), with shops catering to all your daily needs. Once arrived, you can do almost everything by bike (local bike rental). Finistère's endless beaches are 6km as the crow flies and "our" local beach offers a surf- and sand-yachting school, lifeguarded beach and a wonderful bistro. Many of Brittany's magic sites are within 45 minutes' car drive, including Pointe du Raz, Locronan, Pont Aven, Concarneau. There are 3 golf courses within 30km. 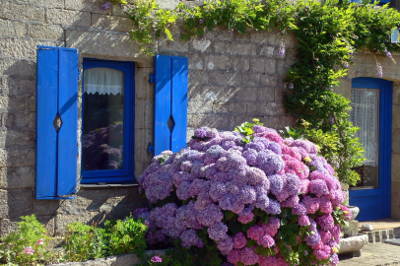 The owners, Brittany-enthusiast expats, live in a separate house on site and are happy to share their tips and help. Easily accessible by a variety of transportation methods, Kerargon lies 20 minutes from Quimper (autoroute exit/airport/TGV train station), 1 hour from airport Brest. Ferries from the UK arrive 2 hours to the north. We are happy to send you detailed instructions on how to reach us from your individual departure point. Pick-up in Quimper can be arranged. Your holidays begin here! Book now!